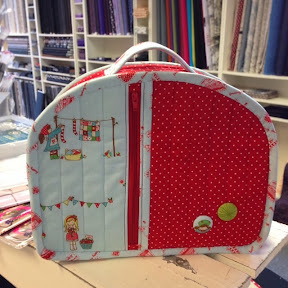 I actually remembered to take a picture of the finished toiletry bag at the shop yesterday. I think I need to make at least one more, such a cute pattern! This bag is absolutely fantastic !!! Very cute. Love the fabric. Så søt toalettveske! Hvilket mønster er det...? Det är en underbart vacker liten väska som Du sytt, tycker jag!